Read this page below, and click the links on the left for RYLA or Young RYLA. RYLA (Rotary Youth Leadership Awards) is a life-changing leadership training program for young men and women where leadership skills and principles are learned, developed and enhanced in an atmosphere of trust and respect. The purpose of RYLA is to encourage and assist current and potential youth leaders in methods of responsible and effective leadership. Many past RYLArians have said, "It was the best week of my life!" Rotary clubs in districts 5440 and 5450, throughout Central and Northern Colorado, Wyoming, Eastern Idaho and Western Nebraska sponsor students to participate in these 5-day leadership conferences known as Rocky Mountain RYLA. DONATE! Click here to make your tax-deductible donation to help sponsor our future leaders! Donations are always welcome, but donations on or before Dec 10 include a partial match so over 100% of your donation goes to RYLA! 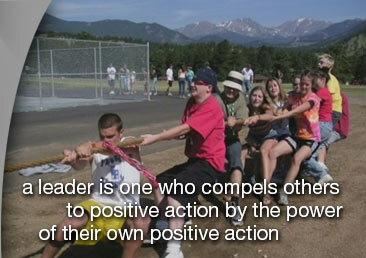 The two RYLA Conferences for 200 participants each are held at the YMCA of the Rockies in Estes Park, Colorado. These conferences are also referred to as Senior RYLA. Any high school sophomore or junior may apply to attend RYLA. Generally, applicants selected have excelled in one or more areas of high school involvement and have potential or proven leadership experience. Applicants MUST be able to stay for all 5 days of the conference! Since 2015 we've been running TWO RYLA Conferences for 200 each (400 total). Click on the About RYLA link toward the upper left corner to start your application! The Young RYLA Conferences for 144 participants each (288 total) are held at the Pondorosa Retreat & Conference Center in Larkspur, CO. Any current 7th grader may apply. Click on the About Young RYLA link toward the upper left corner to start your application! RYLA Plus for physically-challenged teens is held at Easter Seals' Rocky Mountain Village in Empire, CO. See this video! This section is for ROTARIANS ONLY! Self-running PowerPoint presentation is HERE (12 Megs in size).